Abstract: We demonstrate propagation of terahertz waves confined to a semiconductor surface that is periodically corrugated with V-shaped grooves. 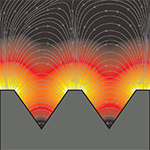 A one-dimensional array of V-grooves is fabricated on a highly-doped silicon surface, using anisotropic wet-etching of crystalline silicon, thereby forming a plasmonic waveguide. Terahertz time domain spectroscopy is used to characterize the propagation of waves near the corrugated surface. We observe that the grating structure creates resonant modes that are confined near the surface. The degree of confinement and frequency of the resonant mode is found to be related to the pitch and depth of the V-grooves. The surface modes are confirmed through both numerical simulations and experimental measurements. Not only does the V-groove geometry represent a new and largely unexplored structure for supporting surface waves, but it also enables the practical fabrication of terahertz waveguides directly on semiconductor surfaces, without relying on reactive-ion etching or electroplating of sub-millimeter metallic surfaces.